The third Harry Potter film brings a new director and a new attitude to the franchise, mixing things up a bit in just the way that was needed. Cuaron had some experience adapting novels to the screen (A Little Princess, Great Expectations), but was just coming off directing Y Tu Mama Tambien, a decidedly adult film. He had yet to go on to make Children of Men and Gravity, but the studio must have seen enough of his talent to know that they wanted him to take this fantasy universe in a unique direction, that their film series required a boost, despite the success of the novels and of the movies. Cuaron was exactly what the doctor ordered, looking back on it now, and his dark take on the maturing third book made it something more than kid’s fantasy. Harry is back at Hogwarts after a slight misuse of magic that inflated his aunt and a ride on the Knight Bus after he ran away from “home”. Instead of being punished for his actions at the Dursley’s, Harry is being forgiven more quickly than ever and protected in ways he’s never been before. The reason lies in the escape of a wizarding convict named Sirius Black from the dreadful prison Azkaban. Black aided in the murder of Potter’s parents, and now appears to be after Harry himself. A new Defense Against the Dark Arts teacher and a host of evil dementors, the guards of Azkaban, keep things at Hogwarts on their toes, while Harry tries to unravel the mystery of Sirius Black; why he betrayed his friends to Voldemort, how he is sneaking onto the grounds of the castle despite the dementors, and what Harry will do when he comes face to face with the notorious prisoner. 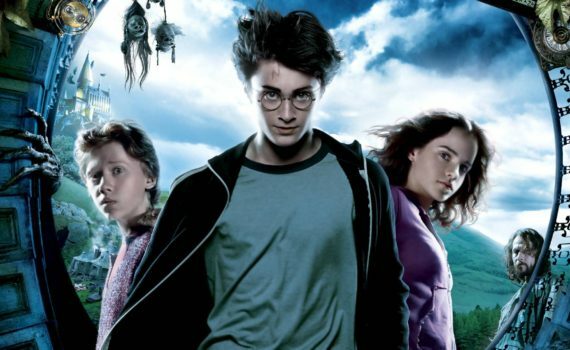 If Sorcerer’s Stone is a cool introduction and Chamber of Secrets is basically a carbon copy, Prisoner of Azkaban is a step toward an artistic direction, a modernizing of the story that pays homage to the book but also takes a lot of liberty when it comes to changing it to fit the screen. When it first came out and I saw it in the theatre, I remember being put off by Harry in Muggle clothes, by the license taken with the arrangement of the plot, by the black mood that hung over the entire picture. Now though, I can appreciate exactly what Cuaron did, and perhaps even credit him with saving the franchise. I love Chris Columbus, but were the stories left in his hands we might have ended up with a children’s adventure series, nothing more. Cuaron darkened the mood, played with cinematography, advanced the script, and crafted something that was both what we wanted and surprised us with its originality. The character additions helped a ton too: David Thewlis as Lupin, Gary Oldman as Black. They were tremendous, and basically stole the show. I appreciated the pendulum and the entire time/seasons element, the starring trio solidified as a group and Grint returned to from, the film as a whole spoke to adults as strongly as it spoke to kids. Azkaban is the best of the original HP trilogy, a redoubling of effort that does not go unnoticed.